An Old Covenant Restated - The seed of hope had been planted in the heart and mind of a chosen people centuries before when God first covenanted with a man called Abram. Prophets had been sent by God at various intervals in Israel's history to insure a bloom on his planted flower. And then Jesus came, conceived of the spirit and born of Mary. The Church is Born - And so the mantle passed and while one kingdom listened to its own death rattle, another, now fully gestated in the womb of God's wisdom, was in the process of being born. A new community was born of the old that was destined then and now to carry on the mission first given to Abraham. The Church Is a People - It is first and foremost a people that is ordained by God to play a specific role in the historical process. Born, Nurtured, and Sustained by God - The church is a body of believers that recognizes its origins in the initiatives of God, and its effectiveness in the world is in its dependence on God. A People That Shares the Abrahamic Mission - Sharing a continuity of purpose and mission with the ancient Abrahamic community, the church, like the "covenantors", receives to give, serves its Lord by serving others, and consistently seeks a kind of selflessness that will permit it a lifestyle that was modeled by its Master. A Servant People - That lifestyle, of course, is servanthood! Those who stood closest to the great events which had shaped and given birth to the church saw themselves essentially and principally as members of a servant community. They were a people that had a mandate from God "to give life away", if need be, in their perusal of a relevant and meaningful ministry to a hurting world. Christ Is Its Head - In possession of Christ's mind-set, the believing community sees the world through the lenses of God; and it aligns itself, not with the values or treasures of a particular culture espousing its own causes, but with the values of God, the treasures in his house, and the jewels in his keeping. A Recipient People With a Motive for Mission - The church is a recipient people that are made able to love by the love they have received from the Creator. The objects of God's compassion in the face of their weaknesses and the recipient of his forgiveness in the face of their sins, the community of belief, out of a grateful heart and a spirit of thanksgiving, fervently seeks to love others about them as they have been loved. The Proclaiming Agency of God's Purpose and Will - The church's motive for proclaiming the will and the purpose of God is not born out of "a sense of duty" to him. Its witness to the world is forever laced with Christlike compassion, never pushy or coercive; and its outreach is not laden with hidden agendas that are contrived and affected. A People of Two Worlds - Living in the light of Christ's resurrection, the church puts aside a "limited view" of life and existance and holds firm to its expectancy of life beyond death. Yet, while it waits for that passage from one world to another, the church conceives of its mission to be unalterably tied to the present domain in which in now lives. A Reconciliatory People - The separation between the "haves" and the "have-nots"; the building of walls between the rich and poor; the inequities that exist between the strong and the weak; the incongruities extant between the free and the enslaved; and the distances that prevail between the "respectable" and the "outcast" are labeled by many as ugly realities that cannot be changed. Not so with the church. 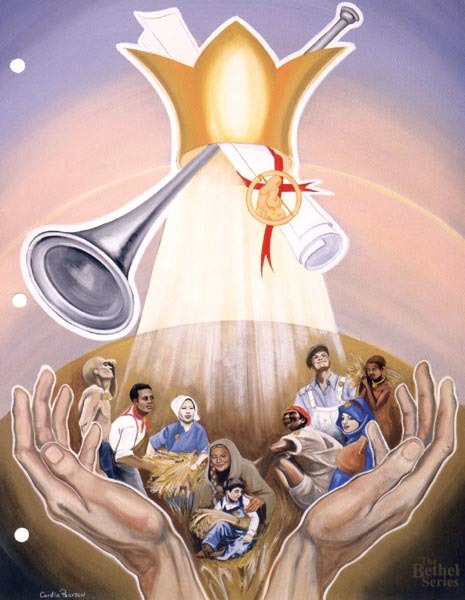 The church pursues its reconciliatory mission by trumpeting the theme that whoever we are and whatever our status, we are citizens of one planet and children born of the same cosmic Father who deigns to make of us a redemptive community in which the scattered and the separated peoples of his earth are made one in Christ. A Redemptive Agency in the World in Which It Lives - Both Old and New Testaments affirm the premise that God uses the human vessel as the instrument through which he manifests himself to the world. Consequently, whatever we receive from the hand of God will come to us through the hand of a person or persons in whom his spirit is residing. It is in the sense that the church, as Christ's body can rightfully be called a redemptive agency. Labels and Functions - The people that constitute the church are called by such names as royal priests, workers for God, and ambassadors of Christ. They are labeled by Paul as "the aroma of Christ" and are enjoined by their Lord to love as they have been loved, to forgive as they have been forgiven, and to exemplify in their natures the very nature of the heavenly Father who gave them life. The Continuum of Christ's Mission - When true to such mandates, the "body of Christ" (the church) becomes the continuum of the work and the mission which Jesus began; and God's redemptive agency goes on in the world. The Distributor of God's Compassion - The world is overflowing with an abundance of unmet human needs. From the despair of the human spirit to the ugly retchings of an empty stomach. They are born, not of God, but of man's inequity to man. To feel compassion is to sense and identify those needs. To be compassionate is different. Need is not only identified, but it is acted on in such manner that human anguish is alleviated, whatever its kind, and whatever its sources. We are here, as members of Christ's body, to be distributors of the Lord's compassion. The Duplicator of God's Forgiveness - Just as the "people of God" are called to be distributors of God's compassion, so they are called to be the duplicators of his forgiveness. Love and forgiveness are intimately related. Human or divine love is just as large or just as small as the size of one's tolerance for weakness and imperfection. Where there is no room in the heart for the malfunctions of mortals, love can survive only as long as "the loved one" fulfills all the conditions of "the lover." Although this mentality may characterize much of the world, it has no resemblance to the nature of God's love. For God loves without condition, and the stretch of his forgiveness knows no bounds. God does not condone human weakness or "look past sin", but neither does he make human erring a reason for rejection. Such news is good news. The Mediator of God's Love - When the church manifests the kind of forgiving love in its relational lifestyle with the world, it not only proclaims the good news of God, but it becomes that news! The activity of distributing God's compassion and duplicating his forgiveness makes the church the mediator of God's love. This means that the effectiveness of the church as a redemptive agency is not so much related to "what it is saying" as it is to "what it is doing." When doggedly loyal to the directives of its "head", the "body of Christ" plays out that mediatory role and becomes nothing less that the very feet of God running endlessly on errands of mercy; the arms of God reaching out to embrace the loveless; the ears of God listening for the cries of the anquished; the heart of God brooding over the plight of the poor and the oppressed; the eyes of God seeking out the lost and the estranged; the lips of God, declaring with boldness, his purpose and his will. The Embodiment of God's Justice - To be attuned to the needs of the destitute, the afflicted, the poor, and the oppressed is one thing. To bring God's justice upon their plight is quite another. The church of Christ makes God's concerns their concerns and enters into battle with every human venture which fosters injustice. Wherever there are inequities visited upon the helpless; wherever there are exploitative ventures that are designed to make the rich and the powerful fat and sleek at the expense of the poor; and wherever there is the forging of an ideology that benefits the few at the expense of the many, there the church is called "to do battle" that justice might be done. It pursues that battle, not from an ivory tower where an appointed committee cranks out resolutions about the justice of God, but by appearing on the battleground itself as the embodiment of God's justice. Reprise - The compassion of God, the forgiveness of God, the love of God, and the justice of God is never so close and never so real as in those moments when we stand in the presence of a person or persons in whom his Spirit is living and dwelling. Such persons constitute "the body of Christ," and it is in that body and through that body that God has worked and continues to work to redeem his world. Uplifting hands - It is a people that is born, nurtured, and sustained by God. Scroll in Crown - It is a people that shares a continuity in mission and purpose with the ancient Abrahamic community. Servant seal on scroll and clothing - It is a servant people that models its lifestyle after Jesus, its Lord. Crown - It is a people that takes its directives from Christ, its head. Ray of Light - It is a recipient people with a motive for mission. Trumpet - It is the proclaiming agency of God's purpose and will. Silhouetted sphere - It is a people walking in the light of Christ's resurrection and looking ahead to a second world. Ethnic Mixture of many peoples - It is a reconciliatory instrument in the hands of God, ordained by him to gather the scattered and the separated people of his earth and to make them one in his saving Christ. Cross on scroll - As the members of "Christ's body," it is a people that has been called by him to be a redemptive agency in the world in which it lives.